We will periodically update the bully file based upon the material our members send to The Deaf Community. It will consist of re-posts of instances/episodes of cyber bullying and is designed to “out” bullies. It is shameful that members of our community have been targeted or received death threats because of their advocacy in the deaf community. We don't initiate the material shared here, just expose it. We recognize the deaf community is diverse and comes with a rich history of successes and struggles. We will not support anyone who seeks to suppress any deaf communication mode. People who think that ALL deaf people should speak and hear with technology are wrong. People who think ALL deaf people should sign and be a part of Deaf culture are wrong. We won't settle for less as we strive to amplify the impact of the entire deaf community to work together to support all communication opportunities. Vultures - Companies that sell services or products to our community. We have decided that vendors (hearing aid companies, interpreting services, captioning companies, relay services, or implant manufacturers) should not have a greater voice than the individuals and families that belong to our community as a whole. Bullies – if you are caught calling for the denouncement of individuals, trolling for information to use against individuals, creating petitions designed to remove all choice or hamper free speech, engaging in a campaign to get a person fired based on communication modality, or attempt to silence or take the rights of deaf individuals, parents, advocates or professionals within the community. We have been inundated with bully material concerning matters like LEAD-K and upcoming events like the CEASD & OPTION joint meeting. We appreciate our vigilant member support at TDC in sharing with us what matters to you. The Deaf Community is a shared community. There needs to be mutual respect for all forms of communication available to the deaf, deaf-blind and the hard of hearing especially when it comes to language acquisition for these children. 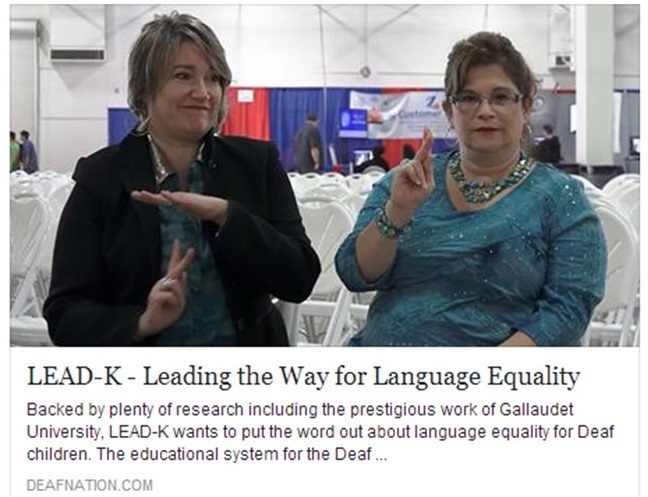 It’s extremely disheartening to see narrow-minded comments like this one from Sheri Ann Farinha who is a stakeholder in recent legislative initiatives known as the Lead-K (Language Equality and Acquisition for Deaf Kids) campaign. When it comes to the children, as a community, we need to stop the hate. Look beyond your biases to encourage every opportunity to acquire language and support parents. Language acquisition is not a competition and there should be room for everyone at the table. It’s time to celebrate diversity and empower families. If you are a parent to a child who is deaf or hard of hearing commenting on a social media video that is about how to raise your child when it comes specifically to what language to give them and who should raise them, it is being a pure bully to message that parent with an attempt to silence them or devalue their experience. 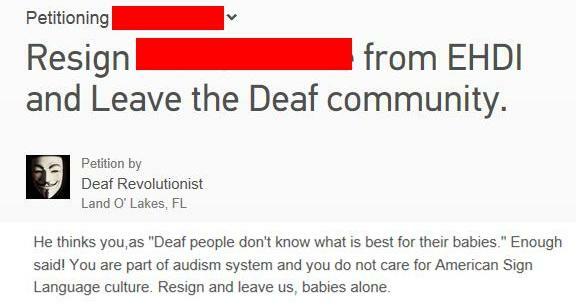 Andra Speer's action is not welcoming or appropriate to encourage parents to participate in the Deaf Community if this is the hateful response they will receive. Haters are not respectful of all the choices parents have in pursuing language for their deaf or hard of hearing child(ren). 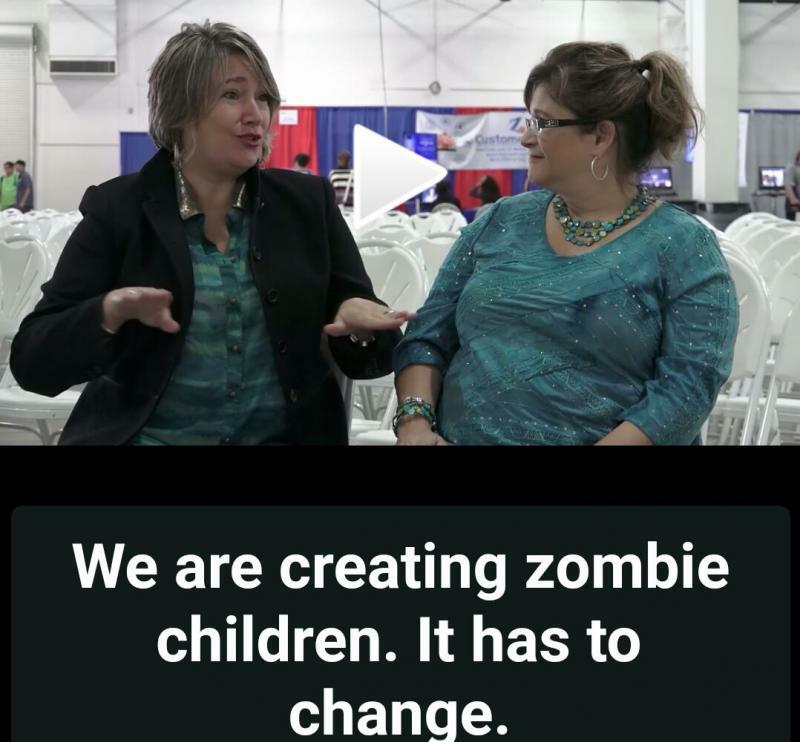 Publically declaring in this video that a system which includes the auditory aspect is "creating zombie children" is not respectful of parent choice and/or an attempt to scare parents. It is disrespectful to parents, hearing health professionals, the medical community and is simply abusing the opportunity to educate our deaf community. The hosts of the video go on to generate inaccurate and generalized statements about what hearing people want for deaf children or that hearing professionals - doctors and teachers - are all about the business to make money. It is unfair to discount the intentions of any person, hearing or not, and just gross tactics to perpetuate fear and hate. 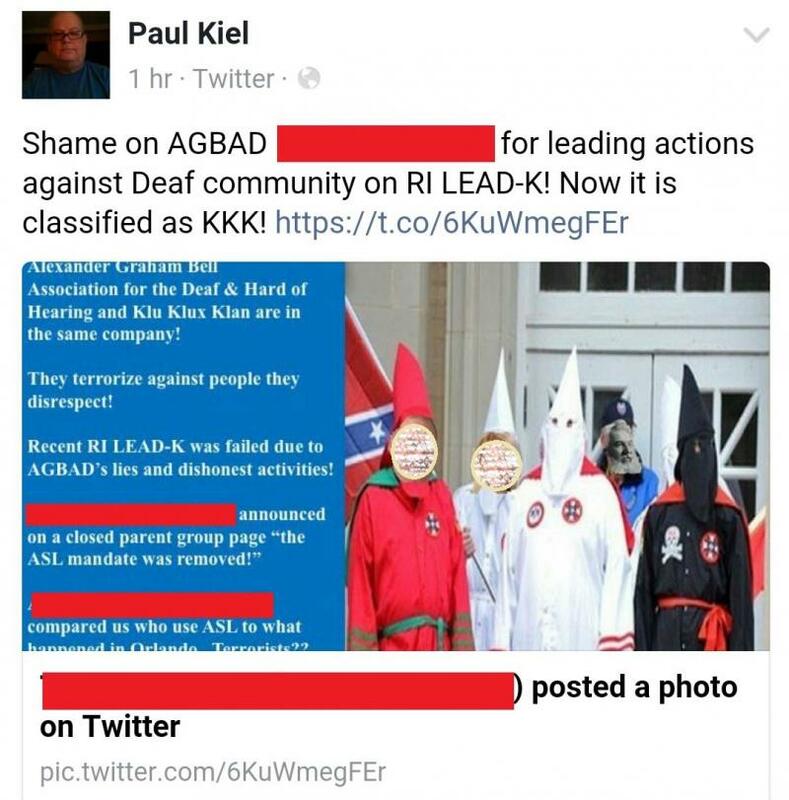 It is disappointing to see this by the leadership of the language equality movement known as LEAD-K spearheaded by Sheri Ann Farinha, Campaign Director, and Julie Rems Smario, Public Relations Director (seen in the video images below)﻿. These types of messages and marketing style demonstrates that LEAD-K and those behind it are not equally considerate of all the language options available to deaf or hard of hearing children. The Deaf Community cannot ignore this post circulating and will not tolerate bullies denouncing any organization or person who helps families of children who are deaf or hard of hearing and their families by comparing them to a terror network. To make this public suggestion while spinning and twisting words or actual events is pure propaganda to further incite hate and misinformation. These spin tactics are deceptive, manipulative and lack respect towards the Deaf Community where so many are working hard to openly, honestly and respectfully level the playing field for all deaf or hard of hearing children. 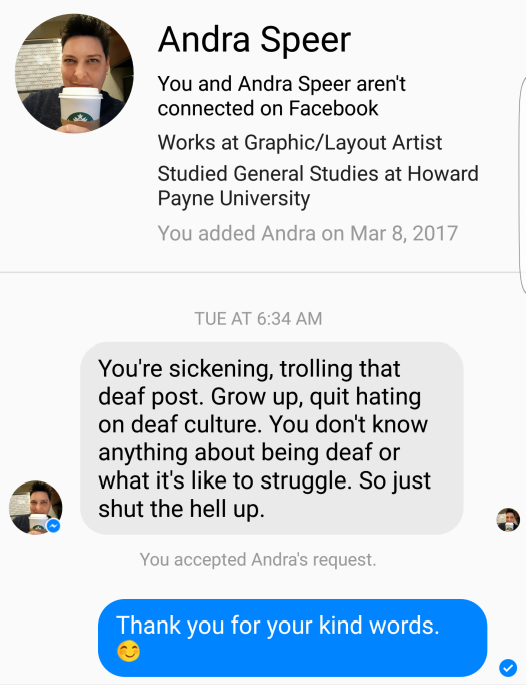 An example of bullying and encouraging other members of the deaf community to continue the hate. The author of these statements even "dares" to use a Hitler comparison in the post to engage the campaign. TEXT FROM THE IMAGE ABOVE BY SHERI ANN FARINHA: "Shame, shame, shame. This is outrageous, FALSE PROPAGANDA! Just like HItler. Yes, I dared. CI's are NOT brain development devices! They are devices to amplify sound. This is saying that the only way brain develops is IF one can hear and process sound. NOT TRUE!!!! Need to file suit against people, and companies who promote WRONGDOING. What's more- this is not a cure! It is not brain development. If the child is able to hear anything it is about language. Learning to acquire language. Despite its purpose to help some "hear", This is just a temporary 'fix". Enough with the Wolf in Sheeps clothing. This is linguistic homicide using this propaganda. 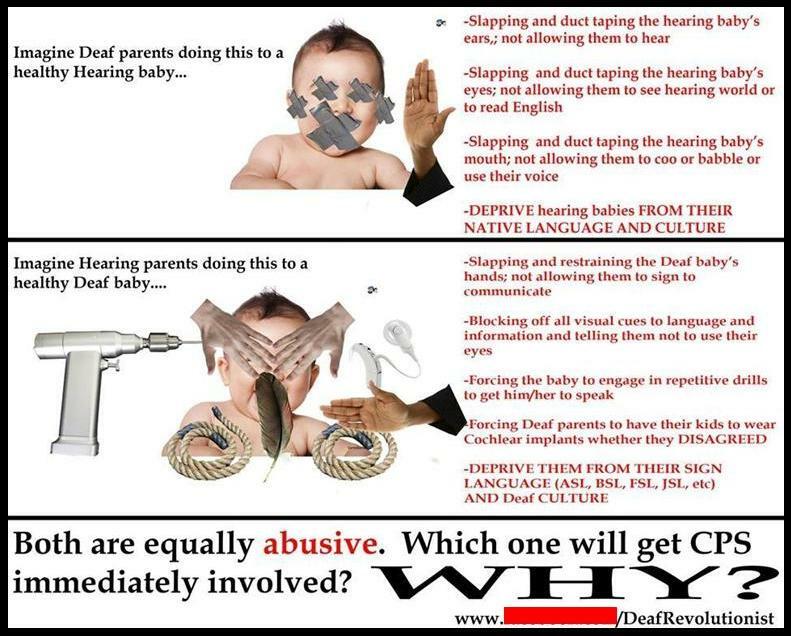 This is Ad and others like it are FALSE> PARENTS of Deaf CHILDREN, BEWARE!!! REPORT IT TO FB as FALSE and IRRESPONSIBLE ADVERTISING!!! !﻿"
Comment from public post on June 25, 2015. When a person intentionally uses their words to make parents feel bad about raising a deaf child or their choices, it is a form of bullying. This piece by Julie Rems-Smario puts words in parents' mouths and minimizes the parent experience of an unexpected diagnosis of hearing loss. 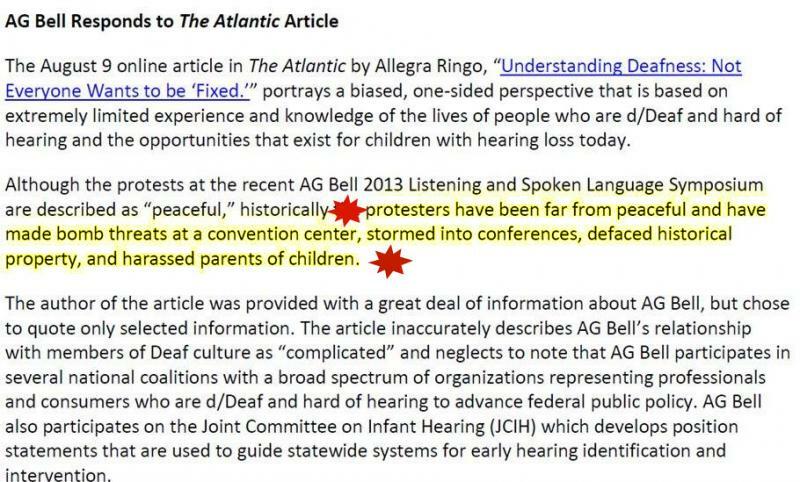 To claim "...the Deaf Child is the center of their pain" and "Deaf children are often treated like the objects of inspiration and burden" is absolutely unprofessional and terrorizing. If 2015 is going to be the year for deaf children, it is going to be the year for early intervention, educated parents and ALL deaf children whether they sign, speak, cue or use multiple forms of communication for their children with hearing loss! 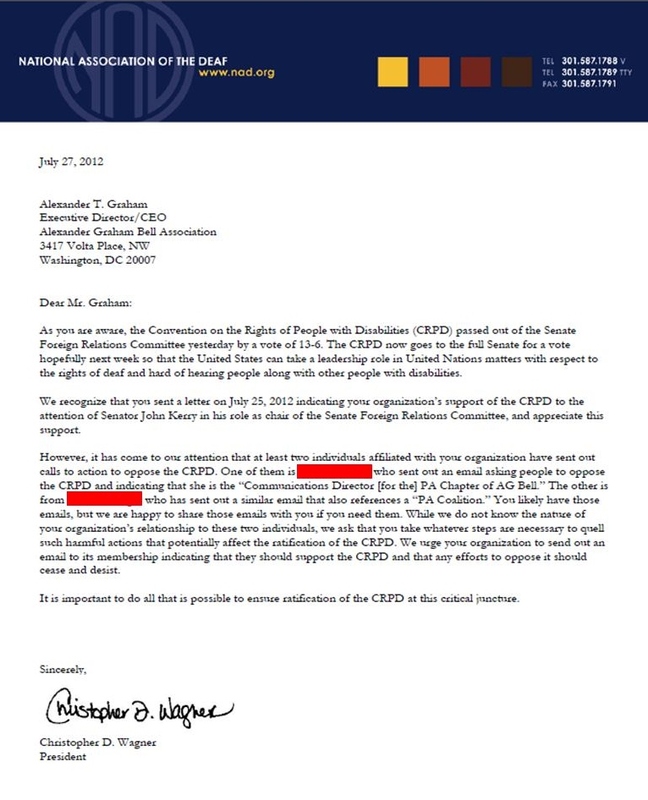 In July 2012, the President of the National Associaion of the Deaf (NAD), Chris Wagner, disseminated by social media a negative letter to his followers in an attempt to call out those of advocating for delaying ratification of the Convention on the Rights of Persons with Disabilities (CRPD) until it included inclusive/clarifying language in the document in regards to auditory-oral communication. Mr. Wagner attempted to have oral deaf adults, parents, professionals advocates and others "denounced " or " terminated" for their efforts to speak up for this majority segment of our deaf community. As of July 17, 2014, CRPD is back. It shows no changes to the controversial and biased language in CRPD to be inclusive of auditory-oral communication options. Sources tell The Deaf Community that NAD is still vigorously opposed to language inclusive of an auditory-oral communication option. Feedback we are receiving from our TDC members is that you are dismayed that the overwhelming representation to the U.N. is from the signing deaf only. Members are also suggesting that NAD should represent the signing and oral deaf community OR change their name to National Association of the Signing Deaf. While The Deaf Community is excited for the opportunities CRPD could offer the disability community in the U.S., we are very alarmed that the language does NOT reflect the U.S. deaf community. The Deaf Community is very concerned this will take away the educational rights of parents of children with hearing loss. It's time we demand the end to bullying within our own community. 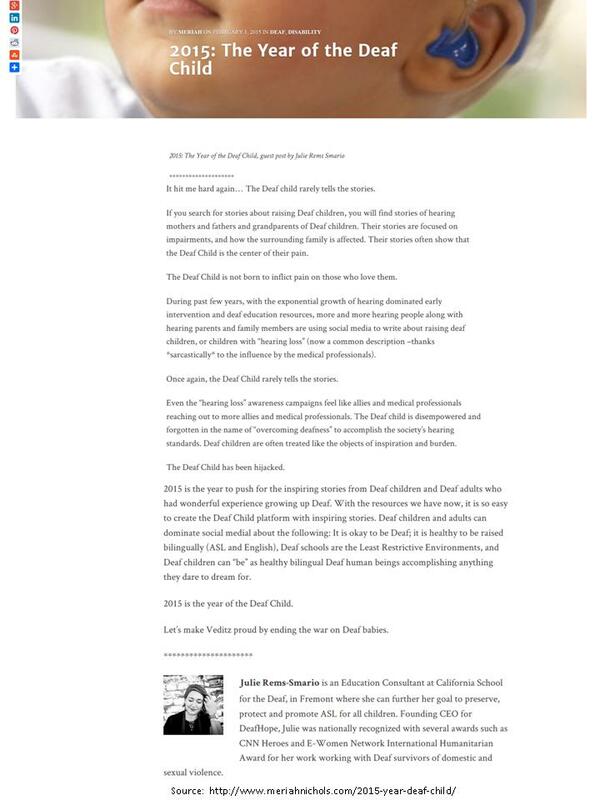 Let's show Chris Wagner we will speak out on behalf of children who are deaf and put the child first. For more on how you can speak up, please visit our "Legislative Initiatives" section of this website﻿. Example of unsolicited material being sent to parents of newly diagnosed children. Bullies troll Facebook pages for parents of children with to stalk them with anti-oral, anti-CI propaganda and prey on their emotions. This method of seeking out individuals to taunt and hate is not a way to encourage parents to look into other communication modes if this is the mentality of what they see as representing the manual communication proponents. NOTE: This information was sent to TDC by a parent who contacted us seeking information and truth about hearing loss, and was slightly distraught at the lengths these bullies go through to repeatedly send unsolicited communication to his/her Facebook message box. We are happy to report that TDC has been able to provide this family with a TDC mentor which has directed them to factual resources on all communication opportunities and referrals for them to research and make their own amplification and communication plan. This family was happy to share one of the disturbing messages they were sent without their permission and asked that TDC post it. 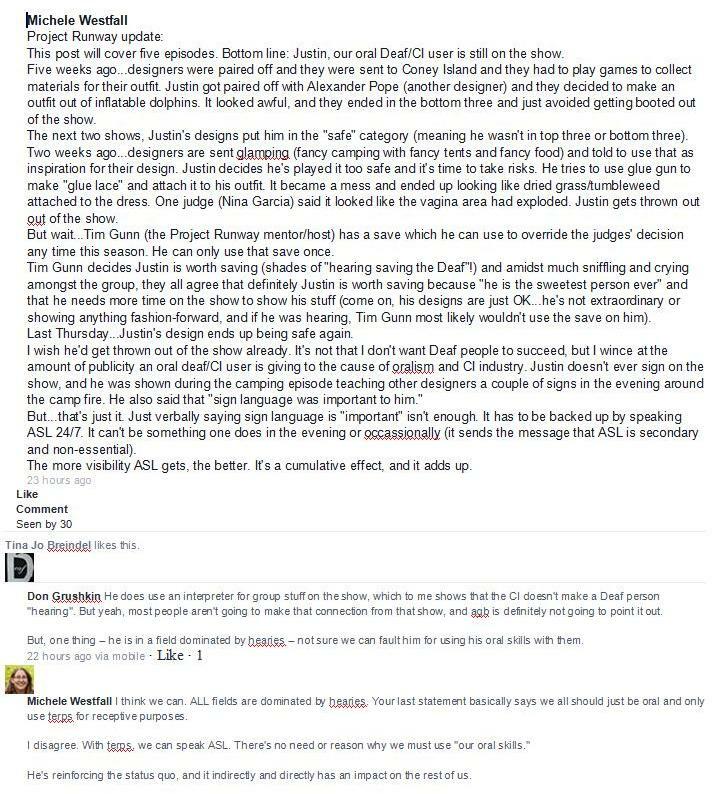 A September 26, 2013, post in a Facebook group about children receiving the gift of hearing from a cochlear implant charity yielded some of these vile responses that TDC members recognize as examples of haters. 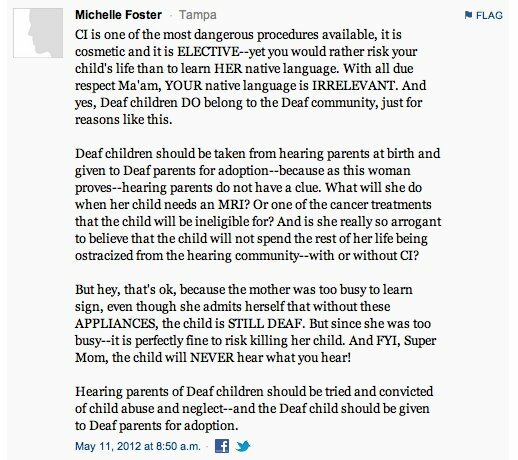 The disrespect of choices disregards the vast majority of the growing deaf community who utilize a cochlear implant(s). To even mention killing doctors is just alarming ("lol" or not), yet somehow continues to be permissible by the multiple participants in the thread. This is not pride. This is hate. We appreciate the many member alerts to this specific example. Demonically altering images to incite hate and spreading deception in an attempt to condemn an individual and silence a professional is bullying and sordid behavior. ﻿We have obscured the victim's name and image. Example of haters within the deaf community. Instead of wishing a fellow member of the deaf community appearing on Project Runway well and cheer him on, there is hatred. You don't see people advocating to remove all ASL users from TV show Switched at Birth and replace with speaking deaf actors utilizing technology only. It would be a much more productive effort to support all members of the deaf community and make use of this energy to advocate for an ASL user on the next season of Project Runway instead. The fear of status quo is an artificial apprehension perpetuated by falsehoods. There is a part of this community that needs healing but does not know it is ill. The Deaf Community may have to add a new category to the bully file for this one. 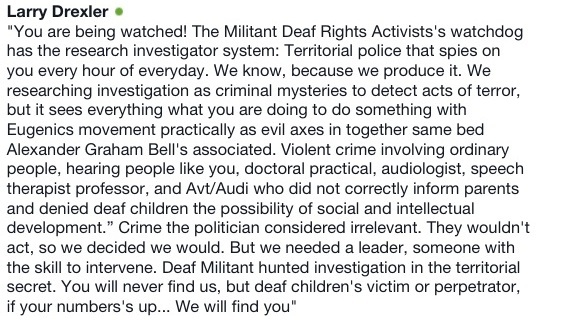 Disturbing to see any part of the deaf community refer to themselves as militant, refer to acts of spying and threatening "your numbers's up..." Sent to us by a TDC member from Facebook, August 2013. Creating and supporting a petition designed to get a private person fired and calling for the denouncement of that individual to take away their professional rights to work within the deaf community is bullying. We have obscured the victim's name and will not promote the link of the online petition website a TDC member took this from. Denouncement of an individual and calling them a name is bullying. The Deaf Community does recognize MANY have nothing to do with this type of hate and bullying, but we all have a duty to recognize this behavior does exist and denounce their actions. 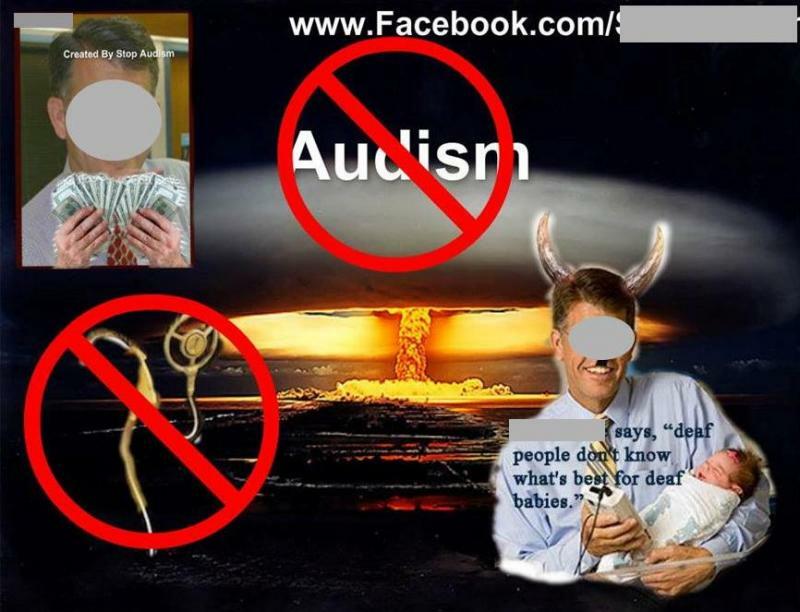 This photo was sent to The Deaf Community by a member with comments that it was posted on July 20, 2013, on Facebook on the Audism Free America page. We have obscured the victim's name. "We have not harassed parents..."
"We have been attacked and slandered..."
So, The Deaf Community has to ask... REALLY? Do they not witness their own work? Is not this photo evidence of harassment as well as the resign petition above? To cry they have been attacked, but isn't that what they are doing here in this van photo and with the petition evidence above? Is this an example of peaceful confrontation they claim to be about? Their idea of taking a stand is attacking, harassing and without doing the due diligence research before spreading untruths. "My 4-year-old daughter is deaf. She is not "Deaf" with a capitol D. She simply has no hair cells in her cochlea, she has no functioning inner ear. Even though she is deaf, she is not automatically part of your little world of shame and exclusion, and her native language is not ASL. It is not child abuse if we decide to raise her in a household that speaks English. So: f#!& you for claiming her as your own, without a second thought to the wishes of her parents." Share instances/episodes of cyber bullying by becoming a member. Apply for your membership by completing the form on our "contact us" page. We will obscure the name of any victim of bullying. Your name will not be published in association with your submission. Our interest is to “out” bullies only.